The International Awards for Powered Access (IAPA) has shortlisted Kosran for its “Contribution to Safe Working at Height”. The awards will be presented on 3rd April in the Beaumont Estate Hotel in Windsor near London. Civil engineering contractor BAM Nuttall has installed new fleet management technology to its crawler crane fleet to prevent unauthorised use and reduce costs. BAM Nuttall Plant is using Kosran Safety Access Control (SAC) to protect its cranes. The system stops theft and unauthorised use of plant. Linked to operators’ training cards, it also improves site safety as only qualified operators can use the equipment. The plant owner can remotely control both the machines and the operators via an internet log-in, or using an app for smartphones and tablets. This way they can add or delete approved users, geo-fence the location of the equipment and set time frames outside of which the machines cannot be operated. They can also access information such as battery status on electrically powered plant; and more accurately plan machine service intervals based on hard data of hours in use. A new safety and telematics technology for aerial lifts is being rolled out, following successful field trials with Nationwide Platforms. Kosran Safety Access Control (SAC) system was specifically designed and developed to help prevent unautho- rised use of access equipment on job sites. It also claims to deliver money-saving efficiencies for equipment rental companies including increased utilisation, accurate ser- vicing intervals and improved rental income. Following the success of the pilot scheme with Nation- wide, developer Kosran is now offering the technology for sale to the wider access rental market. The technology can be easily retrofitted to most brands of aerial work platform. It requires the user to enter a unique, four digit PIN code before the machine will ac- tivate. If the operator does not have the right code, the access platform remains shut down. This helps to in- crease site and worker safety and reduces accidents and machine damage. The rental company or machine owner can allocate up to 100 PINs to each machine and monitor in real time who is using each machine via their PIN - this also means multiple contractors working on the same site can share machines. Kosran SAC is the only technology on the market that provides remote control over both the aerial work plat- form and who can operate it, said the company. 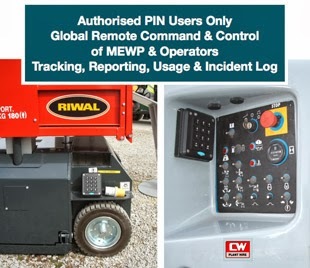 A unique feature is the telematic converter, linking the keypad PIN code-operated immobilisation system to any tracking device, explained the company. This innovation enables the machine owner to view and remotely add or delete authorised keypad PIN codes from a laptop, PC, or an App for smart phones and tablets. The telemetry enables rental companies to remotely track detailed information on machine usage and location, in real time. Kosran also produces daily and weekly reports, helping rental companies to identify each site’s future machine requirements – and to accurately bill multiple contractors for their precise usage of each machine. The technology is designed to significantly increase machine utilisation, generating increased rental income. It also helps better plan machine servicing based on actual hours of operation. Furthermore, the ability to safely hold stock of machines on a site helps reduce transport costs and lower associated emissions. 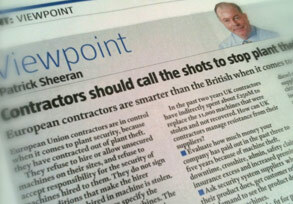 and to increase site and worker safety by preventing unauthorised use of aerial lifts by unqualified operators. “However we have taken the concept further by com- bining it with telematics, creating the first system on the market that gives fleet owners complete remote control of their machines, including who is authorised to use them. Nationwide Platforms, the UK’s largest specialist powered access rental company, fitted 140 Kosran SAC systems to a fleet it supplied to construction contractor Skanska. The machines are in use on the Royal Hospital (St Bart’s) redevelopment in London. The Kosran technology, re- badged by Nationwide as SkySentry, allows Skanska to ensure that only suitably qualified sub-contractors can use the machines. It also enables Nationwide to accu- rately bill the contractor and 22 sub-contractors for the hours spent on each lift; and to keep a stock of machines on-site, safe in the knowledge that unauthorised users cannot operate these lifts. Nationwide now has 500 Kosran SAC systems (all re-badged as SkySentry) for Balfour Beatty, working at Heathrow Terminal 2 and for contractors on the Hydro, Crossrail and other infrastructure projects and will be con- ducting a full product launch later in 2013. Mr Sheeran added, “Thanks to the feedback and engage- ment from Nationwide Platforms and Skanska, we know we have a proven, robust and high quality product that we can now take to market. supplies the specified security. In the UK a procedure whereby the contractor can specify the security and safety features he requires would present UK hire companies and manufacturers with some difficult choices. supplying power directly to the starter circuit. It takes less than 90 seconds to isolate and hot-wire bypass, without using a key, cutting a wire or damaging the machine in any way, and thieves know this. Think about asking for an immobilisation system that shuts off the diesel fuel supply, hydraulics and machine electrics. • 92 percentage of stolen plant is never recovered. Trackers provide super asset management facilities but will not stop your machine been stolen. Nor will a registration or identification system. Not all Immobilisers are appropriate for plant - but guidance means you don't need to be caught out. Engine immobilisers are recommended by both the Home Office and Thatcham to help prevent theft. But picking the right immobiliser can be a challenge. Some of the options which are available on the market may not be fit for purpose, according to government advice. The Home Office has previously published official advicein its Security Guidance Document for Agricultural and Construction Plant, which details a range of various systems that are appropriate for securing equipment. According to the guidance, engine immobilisers are probably the "most practical" method of preventing mid-range equipment being stolen. Immobilisers should also be able to withstand attack for at least 12 minutes. As previously reported on the 7th February last by Glen Crowther Fleet Officer at the CEMEX Castleford Depot in West Yorkshire WF1 2LA, a JCB Backhoe Loader valued at £48,000 was attacked by thieves who failed to steal the machine. Kosran predict that the thieves will not return to this depot. The Kosran ECV integrated Security, Safety & Asset Management ECV System pays for itself in 40 days and then makes you money – we can assume CEMEX agree! There were 52 Deaths in the 12 month period to April 2009 on UK sites. ONLY AUTHORISED USERS OPERATE KOSRAN SECURED MACHINES. Explains what could happen to you and your company.